Proposed symbols of Durango contributed by residents. What symbolizes Durango to you? Common Threads is a public art project that will consist of 15 - 30 laser cut steel panels that will line the median of Hwy 160 and 550 in Durango, Colorado. 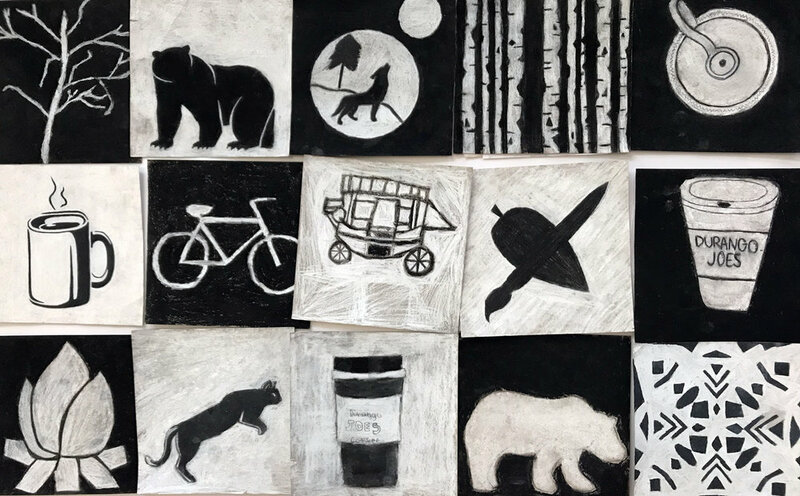 The pictures and ideas submitted by the community will be interpreted, stylized, arranged into patterns, and laser cut by lead artists Bryce Pettit and Allison Leigh Smith. The community has many ways to contribute. Individuals, families, and classrooms can participate in workshops lead by the artists, meet-up discussions in which ideas and doodles are shared, and here through online submissions. This project is funded by the National Endowment for the Arts and the City of Durango Public Art Commission. Progress, contributions, and events will be shared here, as we aim to complete this artwork by the autumn of 2019. Artist, Allison Leigh Smith has extensive experience as a textile designer. She creates unique damask patterns that tell a story by arranging various items together. It is this practice that "Common Threads" is based upon: To mix together seemingly unrelated items, donated by the community, into patterns that speak symbolically of our love of Durango. Pictured are contributions from Durango High School Students in John Burnite’s art class.